The good news about Sunday's "Unite the Right II" rally held in Washington D.C. is that it was an embarrassing failure. A year after hundreds of alt-right protesters clashed with Antifa counter-protesters in Charlottesville, resulting in the death of Heather Heyer, less than two dozen fringe-balls showed up for the sequel. By contrast, the counter-protesters numbered in the thousands, including hundreds of armored and black-clad Antifa. The even better news, per The Washington Post's story "White-supremacist rally near White House dwarfed by thousands of anti-hate protesters," was that there was no violence at the rally! A massive police presence Sunday kept the two sides separated, and outside of a confrontation between some antifa, or ­anti-fascist, protesters and police long after the rally had ended, there were no reports of violence. Police reported that one man was arrested after he assaulted a man wearing a "Make America Great Again" hat. So there was no violence, except for, uh, those very specific acts of violence. Huh. Antifa members vented their frustration at not being able to confront the rallygoers by lighting smoke bombs and firecrackers and throwing eggs in the direction of police. Gosh, just a lot of "anti-hate" people at a rally with no violence tossing stuff in the direction of law enforcement officers (certainly not at them!). Well, they were just "venting their frustration" at not being able to "confront" the alt-right with the explosives they brought. Most began heading home, but police kept a watchful eye as the black-clad group carrying umbrellas wandered about knocking over trash cans, chanting "Bust a window!" and yelling at police to get out of their cars and "meet us in the streets." A confrontation between the protesters and police erupted briefly near 13th and G streets NW. You know, just brief violence, calls for more violence, and actual property damage from the anti-hate protesters at the rally with no violence. C'mon. Antifa members came ready and raring to attack the far-right protesters, and proceeded to attack the cops for not letting them attack the protesters. The only reason they didn't partake in far greater violence as they did in previous years was because a massive police presence showed up to make sure they didn't. They don't deserve any credit for that. 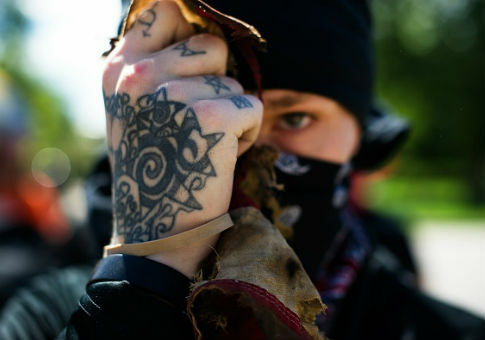 By all accounts Antifa is radical, anarchist, and avowedly pro-violence, to the extent that the Barack Obama FBI and Department of Homeland Security issued a warning calling them "anarchist extremists" and "domestic terrorists," a warning that has since been vindicated by many, many, many, many, many, many violent protests. Why, two years later, are the national media still downplaying the criminal elements of so-called "anti-hate" protesters? Even to the extent WaPo‘s "anti-hate" descriptor was meant to apply to peaceful "anti-fascist" protesters, we're still talking about protesters who chanted things like "No border, no wall, no USA at all!" and "f*** the police." The counter-protesters were obviously pretty far to the left of the average American, yet WaPo described them with benign terms like "anti-hate" and "anti-fascist" and the words "liberal" and "left" never appear in the story. At one point, the paper describes how "hundreds of anti-racist protesters" had been brought to the rally by… the International Socialist Organization. That WaPo bent over backwards to excuse the violence would be embarrassing in any case, but it also happened the day after Antifa protesters in Charlottesville showed up to counter a Nazi protest, found zero Nazis, and proceeded to clash with police anyway. Protesters also attacked reporters, cursed them out while trying to do stand ups, cut news crews' cables, and intentionally blocked photographers trying to cover the rally. Geez, don't they know democracy dies in darkness? Credit where it's due; several journalists did a good job of calling attention to Antifa violence against police and journalists over the weekend. But even when they did so, they were lectured by other journalists. I suspect this sort of response is an overreaction to the infamous comments made by President Donald Trump in the wake of Charlottesville. Trump said of the Unite the Right rally-goers that "the press has treated them absolutely unfairly" and claimed "you also had some very fine people on both sides." Given that the Unite the Right attendees ranged from overt Nazis to merely-very-racist alt-right wackos, the president was rebuked by Republicans, Democrats, and even members of his own administration. But in the zeal to repudiate that notion, many in the media and many more on the left fell victim to an equally irrational belief: that the self-declared "anti-fascist" side was unequivocally good. CNN's Chris Cuomo and The Atlantic‘s Jeffrey Goldberg compared Antifa to brave WWII soldiers storming the beaches of Normandy. When CNN ran a well-researched profile headlined "Unmasking the leftist Antifa movement: Activists seek peace through violence," laying out multiple instances of Antifa engaging in and advocating for violence and property damage, that headline was later changed to remove any reference to violence. That makes for a convenient, black-and-white media narrative, but the side effect is that you have to overlook or diminish the very real, very bad, very violent actors who make up a large part of the supposed good guys. It leads to an even more absurd result where you have to attack a Jewish reporter and left-wing websites who do express concern about attacks on journalists as useful idiots of the Nazis. When "both sides" and "whataboutism" is used to overlook or avoid calling out violence from your allies, it deserves to be called out and shamed. But it doesn't follow that every effort to note violent elements on "both sides" is a bad faith attempt to shield Nazis. The media has a responsibility to report honestly, and when the fact is that anti-fascists engage in violence on a regular and organized basis, it shouldn't matter whose narrative it does or doesn't fit into. This entry was posted in Politics and tagged Antifa, Washington Post. Bookmark the permalink.